This year I've added a studio component to my graduate course in digital history, so the students have a chance to learn some of the fundamentals of interaction design and apply them to their work in public history. In yesterday's class I gave them the task of brainstorming gadgets, appliances, devices, tools or toys that would somehow, magically "dispense history" or put their users in touch with the past in some other way. (The assignment is here). Many of the ideas that they came up with were really interesting. In no particular order, here are some of my favorites. Heritage knitting needles. Passed down within a family, these needles take on the ability to guide their user in the re-creation of any pattern they've been used for in the past. Tangible spray. This comes in an aerosol can. When you spray it in front of you, a grey mist appears. You can reach into the mist and feel the past for a few moments. When the mist dissolves, you're grasping thin air. You might get hooked on such an experience, and buy one spray can after another. History hoe. Use this in your garden to grow heirloom or extinct plant species. Yelling documents. You put your primary source into a machine like a microfiche reader. A stern, professorial face appears on the screen of the reader. As you make interpretations about the document, the reader will berate you in a British accent if you get something wrong. Hard to please, it only admits correct interpretations grudgingly, with harrumphing noises. Reverse Babel Fish. Put on this hearing aid, and everyone around you starts speaking in Old English. Not surprisingly, many of the ideas reworked themes familiar from fantasy or science fiction, like the talking genealogy hat a la Harry Potter (tilt the floppy brim to fast forward or reverse) or a "transporta-potty" that is like Dr. Who's phone booth (flush to reset). Some of them related to subjects of perennial interest to students, like the cabinet that dispensed historical cocktails with music appropriate to the period. For me, part of the fun was asking the students beforehand about their interests, hobbies and skills. I'm not sure what role we will find for talents that include piano playing, gardening, belly dancing, horse riding, knitting and snowboarding... but I'm glad to know their imaginations are in good working order. There are links to all of their blogs on the course website. The architect Christopher Alexander is well-known for having developed the idea of patterns, each of which "describes a problem which occurs over and over again in our environment, and then describes the core of the solution to that problem, in such a way that you can use this solution a million times over, without ever doing it the same way twice." The idea was enthusiastically adopted by software engineers and is now found in various forms throughout the digital realm. One very interesting manifestation is the recent report by Thorsten Haas, Lars Weiler and Jens Ohlig on design patterns for "Building a Hacker Space." This report is required reading for anyone who is interested in the transformative or disruptive potential of new technologies in academia. It describes ways of creating and sustaining spaces for people to hack in, by providing a series of problems and solutions. For example, "You have a chicken-and-egg problem: What should come first? Infrastructure or projects?" They suggest that you "Make everything infrastructure-driven. Rooms, power, servers, connectivity, and other facilities come first. Once you have that, people will come up with the most amazing projects you didn't think about in the first place." This pattern fits in well with work in cognitive science that suggests that human reasoning and memory crucially depend on richly structured environments that are full of tools (e.g., Hutchins, Clark). In my own research, I've found that modest environmental changes can have significant effects that I couldn't have anticipated. When I was working in linguistic theory, for example, I had a chance to move into a new office where I installed a wall of whiteboards. Being able to see a lot of diagrams spread out in front of me changed my understanding of the material, making it much more visual, and suggested different research questions. When I was studying for my comprehensive exams, I splurged and bought an expensive ergonomic chair. Up to that point, I had always thought I was a fidgety person (too much coffee and Coca Cola), but now I could sit still and read for 8 or 9 hours at a time. I've recently had a chance to set up a study with my workbench directly behind my desk. Now I can rotate my chair 180 degrees and there is the soldering station, Dremel, multi-meter, audio equipment, Phidgets, bins of components, and so on. Having tools and supplies ready-to-hand makes it easier for me to imagine hacks that involve a hardware component. Tools cost money, however, and most grants are resolutely project-driven and fenced in by disciplinary boundaries. In retrospect it is clear to me how whiteboards might make someone a better linguist, or a good chair a better student. I'm finding that a modest electronics lab is giving me a better understanding of the role of acoustics in history. It's hard to imagine convincing a granting agency of these things. Grants tend to be short-term and result-oriented. If you don't know what the benefit will be, or can't relate a particular piece of equipment to a particular result it is hard to make a convincing case for spending the money. But some people get it. A few months ago I heard a poignant story from a Canadian researcher. He requested a lab that was tailored to his work, and ended up with an unsuitable boxy linoleum-floored room with computers facing four walls around the outside perimeter. He doesn't like the space and neither do his students. To make matters worse, a visiting researcher from Sweden showed them pictures of his lab, which looked like something from a design magazine. "That looks like a wonderful space," my friend said wistfully, "I wouldn't mind just hanging out there." "Yes," the visitor replied, "people come to hang out and end up working." Many of my colleagues treat Starbucks or other cafes as workplaces, finding them much more salubrious than their alloted space. It's a pattern you can see over and over in the histories of science, technology, and the arts: the right infrastructure attracts the right people and then something really cool happens. But it isn't possible to predict in more detail than that. One of the things that I was working on over the summer was finding more ambient ways to communicate historical knowledge. As part of that work, I've been recording soundscapes and have gotten in the habit of making a test recording outside my house before setting out. When listening to these test recordings the other day I noticed something odd. I could hear the sound of crickets and other insects, a distant car engine, snatches of music on the breeze, birds, the indistinct voices of children playing. Even though I had recorded the track only a few days earlier, I felt like I could be listening to any summer morning in my lifetime. Somehow the sounds had become unstuck from the time I recorded them and were lazily drifting around. Or so it seemed. It's hard to investigate a feeling but I decided to give it a little more thought. When we are able to see something that is making noise we readily correlate the sound with the object. This can be disrupted a bit in cases where it takes the sound a noticeable amount of time to reach us, as when watching someone bat a baseball from a distance. We judge the distance of a sound source that we can't see in part by its amplitude--quieter things tend to be farther away--and in part by the environmental coloration that the sound has undergone. A sound that reaches our ears directly arrives there before reflections of that sound off of stuff in the environment. If the reflections arrive quickly, they change the timbre of the perceived sound. If they arrive slowly they are perceived as echoes. The ability to record a sound and play it back later makes it possible to create arbitrary temporal distance between the source of a sound and its perception. What I got to wondering was whether environmental coloration might be used to make a sound seem as if it were coming from a more distant past. A visual analogy might be coloring a photograph with sepia tones (cheesy) or filtering the image to simulate the aging of old film (better). 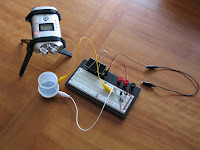 In order to experiment, I set up the following hack. 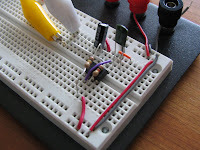 First, I built a simple circuit to generate a relatively pure tone using the handy 555 timer and a few other components. I set up a digital audio recorder right above the circuit and recorded a few seconds of irritating buzz. The rig is shown in the photo below... the white thing on the speaker is half of a Nalgene container that I used for a resonator. I've included the schematic in case you want to make your own. 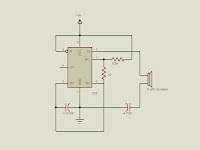 You can lower the pitch by increasing the resistance of the 100K resistor and raise it by decreasing the resistance. When I recorded the sound of the tone generator right above the circuit it sounded like this (WAV file). I then moved the recorder to a position about 10 feet away, near an open window. Finally I moved it into another room about 20 feet away. Using Audacity, I amplified both of these recordings so that the overall sound level was the same as the first one (-21 dB). The recording made at an intermediate distance sounded like this (WAV file) and the one made at the far distance sounded like this (WAV file). Using the frequency analysis capability of Audacity, it is easy to see the effect of distance and noise on the subsequent recordings. Does environmental coloration make the sound seem more distant in time as well as space? I'm not sure. I thought I'd put it out there in case anyone else has the same perception, or wants to hack the hack. I'm the first person to admit that I know nothing about fashion, so I could be wrong about this... but my understanding is that the things to be seen on the runways of Paris, Milan or New York are not really intended to be worn. The point of taking attractive (if emaciated) people and dressing them up like samurai and astronauts, or festooning them with lanterns, is to stimulate the imagination. Designers have a space to convey a sweeping vision without worrying too much about practicality, and their public is drawn to their more quotidian offerings by having a sense of a bigger picture. Automotive engineers, too, have a tradition of creating concept cars: one-of-a-kind prototypes that push the boundaries of particular forms, get ideas into circulation, and draw attention to the imagination and technical expertise of their creators. Academic historians (and many other humanists and social scientists) don't really have a tradition of creating projects that are not meant to be judged primarily in terms of utility or veracity. But we can't complain that our research is treated as marginal unless we are willing to make some effort to put our thinking into forms that are of interest to other audiences than our close peers. I'm not suggesting that scholarly traditions be weakened in any way, just that we create some new traditions. Digital scholarship puts very few restrictions on form and makes it easy to reach a potentially vast audience almost instantly. And yet most new projects offer only incremental advances over the pre-digital state of the art, if that. It's time to make some space for concept projects, to put work out there because it's visionary or beautiful or wacky or reflexive or just, as Thoreau put it, because it "affects the quality of the day."